Frontpoint is our #1 pick for home security, and Link Interactive is our #3 pick. Both companies offer similar service and have good reputations, and each gives you 30 days to test out the system before you’re completely locked into the three-year contract. So why is Frontpoint ranked higher than Link? We’ll tell you more in this in-depth versus article. 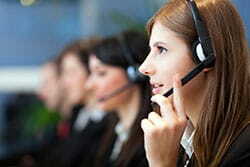 Customer service is one of the most important factors in a security company. Getting a good deal financially but dealing poor customer service is not only frustrating but a waste of money. You want the company you choose to be accessible and helpful. A company that puts you on hold forever, is pushy with its sales, and doesn’t listen to your needs is a company to steer clear of. Both Frontpoint and Link perform well in customer service, but Frontpoint has a slightly better reputation overall. Both Frontpoint and Link Interactive have had customers say great things about their service. Some words described by Frontpoint customers are quick to respond, excellent, wonderful, fantastic, outstanding, and reliable. Link’s customer service has been described as helpful, patient, understanding, awesome, and friendly. How are the two different in terms of customer service? Frontpoint’s customer service is available via phone seven days a week, while Link’s is closed on Sundays. We see this as a con for Link because if you experience issues with your system it’s important that you are able to get the support you need. Customers praise Frontpoint for its excellent customer service. It has an outstanding reputation for listening to its customers and taking care of their needs. Frontpoint isn’t pushy with its sales, which creates positive customer experience. Link has a good customer service reputation but isn’t as highly rated across the board as Frontpoint is. When we were researching for this article, we found countless reviews for Frontpoint raving about the company. Link had great reviews as well, but not to the same extent. Interested in comparing Frontpoint vs. Link Interactive’s packages along with dozens of other packages from the leading home security systems? Take out Home Security Package Selector quiz to get results tailored to you. Do you want to secure a home or an apartment? How large is your home? 0 - 500 sq. ft.
Do you want 24/7 professional monitoring? Do you want DIY installation? What kind of cameras would you like? Do you need mobile access to your security system? What would you like to control from your smartphone? Both Frontpoint and Link offer three-year contracts, which is common for professionally monitored security systems. Frontpoint also offers a one-year contract if you’re open to paying a higher equipment fee. Link also offers both a one-year as well as 24-month contract options as well. Three years is the industry standard, but both of these companies offer shorter contract lengths, which is a great plus. Frontpoint offers a 30-day risk-free trial, and Link has a 30-day money-back guarantee. Neither company charges you a restocking fee, and they both send you a prepaid postage label. What if you want to cancel your service during that three-year period? Frontpoint requires that you pay 80% of the remaining contract, and Link requires you to pay 75% of the remainder of your agreement. Neither company charges an additional cancellation fee. You can avoid paying Link’s remainder balance if you transfer your contract over to someone else. Although this may be difficult to do, it could save a large amount of money. In this category, Frontpoint is the safer bet, but Link has the potential to pay off, so we call it a draw. Frontpoint’s equipment is 100% wireless, and you must install it yourself. The company does not offer a professional installation option, so there is no installation fee. Frontpoint preprograms the equipment, which cuts down installation time. You plug in the control panel, and everything else is peel and stick. After you place everything where you want it, you call Frontpoint to test and activate the system. Link offers DIY installation as well and does not offer a professional installation option. Its website has many resources to help you with the installation process, but that process isn’t as simple as Frontpoint’s. Link’s setup has a few additional steps, but if you use the resources online, you should get through it easily. Below is a table comparing the plans offered from Link and Frontpoint. Both companies offer three monitoring plans that offer different features. All six packages use cellular monitoring, which we recommend. Cellular monitoring is considered the best form of monitoring (opposed to broadband and landline) because you don’t have to worry about phone lines being cut by a thief and your system shutting down. *Crash and Smash Protection is a patented technology from Alarm.com. It alerts the monitoring station of damage to the alarm panel. If you don’t have Crash and Smash protection, the system shuts down if an intruder breaks the alarm panel, leaving your home unprotected. As you can see, Frontpoint and Link Interactive both have three monitoring plans and offer 100% cellular monitoring. Both monitoring services are UL listed, which is a highly recognized approval rating in the electronic security industry. 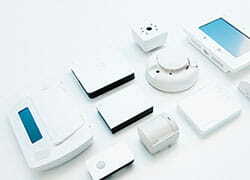 Neither company offers app access from its introductory plans and both systems periodically “ping” the monitoring station to make sure the connection is intact. Where the two differ is that Frontpoint uses Rapid Response, which is one of the most highly considered monitoring stations in the United States. Rapid Response is Department of Defense approved, Underwriters Laboratories Inc. tested, Factory Mutual approved, and New York City Fire Department approved for commercial buildings. In addition, customers rave about Frontpoint’s monitoring and how quick it is and how helpful its reps are. These are two things you definitely want from a monitoring center. These are the people who will be contacting you and telling you your home is on fire or your home has been broken into. You want them to help you feel safe and secure in a time of need. While both Frontpoint and Link have great monitoring, customers cannot stop raving about how wonderful Frontpoint’s is. Frontpoint offers three security equipment packages (Secure for $99, Secure Plus for $199, and Professional for $449), but it allows and encourages customization outside of the packages. Frontpoint emphasizes its customization more than its set security packages, which we think is great. We suggest speaking with a Frontpoint representative on the phone if you’re going to purchase a system from them because you may be able to save money on equipment and you’ll have a professional helping you choose the pieces of equipment you truly need. Link no longer offers pre-selected equipment packages and instead focuses entirely on customization of your security equipment. You start out with a free equipment panel and then pay for each additional piece of equipment you want to add to your system. The only limitation is that you have to select a monitoring plan that supports the equipment choices you have selected. Both Frontpoint and Link support Z-Wave home automation equipment. You can relocate equipment from either company for no additional fee, and both companies offer customization for equipment packages. The key differences are that Link offers a two-way voice control panel, while Frontpoint does not. The equipment used by Frontpoint is General Electric (GE), and Link uses 2GIG equipment. Neither Link nor Frontpoint has a lifetime warranty. Frontpoint and Link Interactive now both offer a three-year warranty. Link Interactive’s change to a three-year warranty on all equipment, however, is a recent change and only applies to new customers. Frontpoint has been offering the three year-warranty for much longer. As you can see, Frontpoint scores higher than Link in nearly every category. The only thing Link Interactive has on Frontpoint is that its monitoring fees are less expensive. Frontpoint’s customer service is outstanding, the equipment is easy to use, and the technology is user-friendly. But most of all, what makes Frontpoint better than Link is its outstanding reputation, which is why we recommend Frontpoint over Link. Wondering what Frontpoint or Link Interactive package will best fit your needs? Check out our Home Security System Package Selector to find which package is right for you.